Posted on August 19, 2013 at 6:29 am. It’s a crystal clear morning in Vermont. The sun streams through the trees as the forest comes to life. You are filled to the brim with inspiration and optimistic enthusiasm. 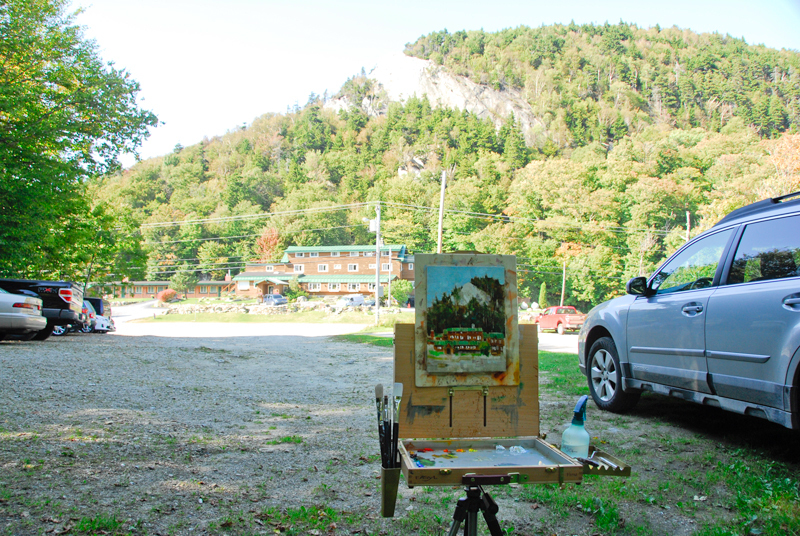 Your easel is set up in front of you, eagerly awaiting the first impassioned brushstroke. THIS is what being an artist is all about! 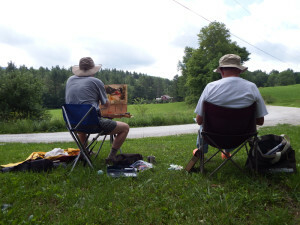 If you have ever painted in Plein Air, (open air) you know that this is only half the story. 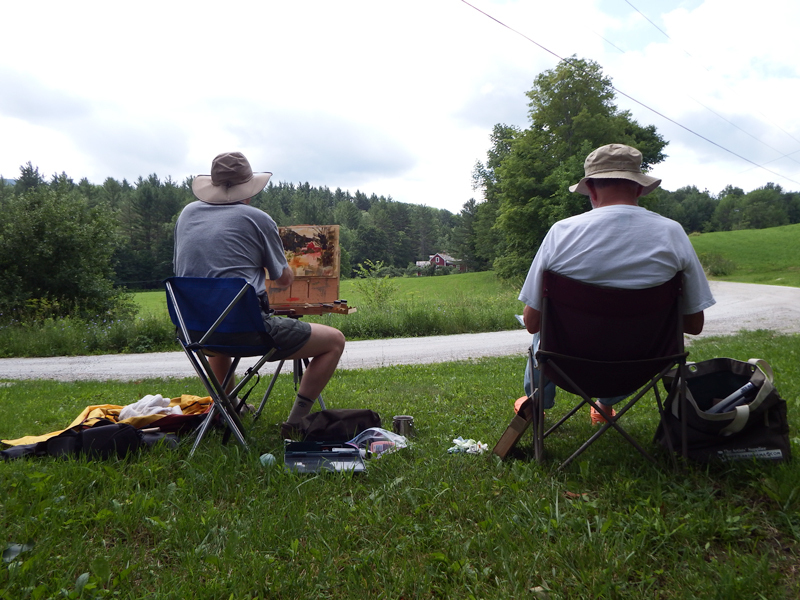 Painting outdoors is a challenge. Not only must you confront a blank canvas, you do it in the face of Mother Nature and all manner of unexpected circumstance. I try to strike a balance between “be prepared” and “travel light.” The most essential thing to remember is your sense of humor. 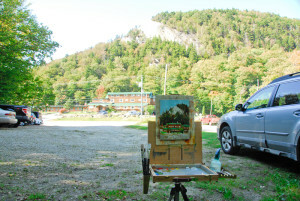 Painting out of doors is a great way to savor the moment, appreciate nature, observe our world, and learn how to paint. Consider it an adventure and enjoy the experience. A good painting is gravy. 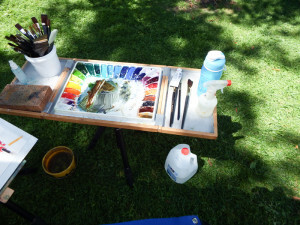 I use both watermedia and oil when I paint outdoors on location. Both have advantages and limitations. Oils are slower drying, allowing me to play with edges for a longer period. Watermedia dries faster, which can be an advantage when you need to get something down quickly. Here are my current Plein Air Painting kits for both Watermedia and Oil. Easel: Home made using a ball head camera tripod. Adjustable tilt and accommodates various size boards. Palette: Frank Webb covered palette, the same one I use in the studio. Filled with juicy paint. Paint: DaVinci Artists Watercolors, plus White Gouache. Brushes: A range of synthetic flats 1/8 – 1.5 inches. Robert Simmons 2″ wash/Sky Flow, riggers, and maybe a round just because. Paper: 300# Fabriano Hot or soft Press. Occasionally an Ampersand board. Other: Folding stool, palette knife, viewfinder, Viva towels, trash bag, water & quart container, large sponge, misting bottle with water, small sketch book and pencils, sun screen, bug dope, wide brim hat, camera. Easel & Pallette: Artwork Esentials Easy L “Classic Mini” tripod mount folding easel/palette combo. Paint: Rembrandt Artists Oils, and various other brands kicking around in my studio. Brushes: A range of synthetic and hog bristle flats/brights 1/8 – 1.5 inches. Canvas: Claessens #15 double primed Belgian linen mounted to 1/8 MDF or Ampersand Gesso Board. 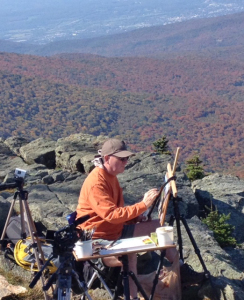 Other: Folding stool, palette knife, viewfinder, Viva towels, trash bag, Gamsol orderless thinner, medium, wet canvas holder, small sketch book and pencils, sun screen, bug dope, wide brim hat, camera. A Day in Vermont is a free and friendly e-mail love letter, each with a brand new painting. 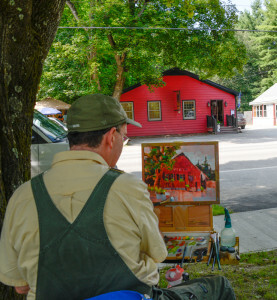 It’s a little taste of Vermont for your inbox. Twice a week…Monday and Thursday mornings. If you love Vermont and enjoy my work, welcome aboard! And just for fun, I give away a free print to one random subscriber each month.